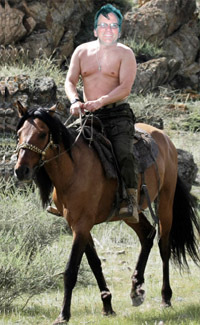 As I recover from my lack-of-blue election result funk, I can see a glimmer of promise among all our challenges. Wakulla County voters voted down wetlands protections but the same state regime that gutted our conservation trust funds will now have to pay attention to the 75% of voters who approved the constitutional amendment to fund conservation efforts. Hopefully some of those funds will be spent on improving water quality in the Wakulla, Franklin, Gulf, and Bay county waters on which many of us sail. Scientists in Florida are being proactive on engaging our “not a scientist” Governor about climate change. Florida is among the most susceptible states to the impacts of climate change and many of the areas we currently sail are already seeing the effects. For us, the most noticeable change will be from sea-level rise. Due to the warming of the oceans and the associated thermal expansion, there is a very well-known and well-predicted signal of sea level increase. On top of this there are additional aspects adding to sea-level rise which have the potential to cause very rapid increases. Glaciers are melting and polar ice sheets are breaking up. These processes are complicated and more difficult to predict but are also contributing to an increase in sea level that appears to be accelerating in more recent years. Sea level rise can’t be ignored… the processes are real and measurable. 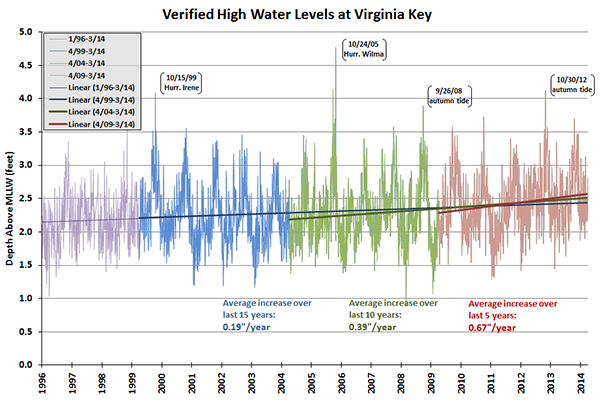 Just across the street from my NOAA lab of 30 years and where I’ve spent countless hours of windsurfing, the Virginia Key tide station data show a rapid increase just since the 1990s. Unfortunately the USF water leve lstation at Shell Point doesn't seem to be reporting. We probably won’t have to think about moving the SPSC trailer for another decade or so but these seemingly small increases can have big consequences during hurricanes. In that case we may want to evacuate the training equipment! Sorry I will miss our Nov.11th SPSC meeting (I’ll be on my way to JAX for hip surgery). 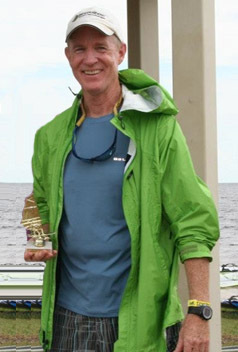 We’ll welcome scientist William Capstick of the FSU Physics Department, who will discuss The Physics of Sailing. Get out your inner sail nerd and get ready to get your questions answered! Go Long or go Wrong! 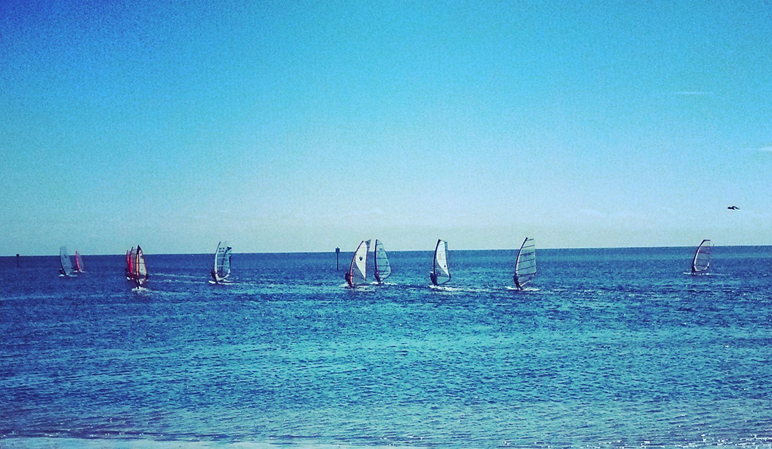 Sixteen years ago, after nearly two decades racing one designs, Olympic classes, and Pro: course, slalom, and wave events, I sailed in my last windsurfing contest, the IFCA Worlds in Tarifa, Spain. A year later, my friend Nevin and his Wife Stina had their second child, a boy named Rasmus… This first week of November, in my first race back in the sport we all love, my years of dull rust met that kid – the amazing, sharp talent that is Raz Sayre, and it was eye opening: he crushed me and 107 others this week in everything from 5-30 kts, enroute to his first World Title. And I was barely competitive with him in just part of one race. 16 years ago, I missed a World Title by one point to Tim Aagesen, who took second this week. This World Championship, I was never close, but had a few moments dueling again with Tim and Nevin, reminding me what fast feels like, and what the fleet looked like from Raz’s view all regatta! Meeting called to order by Commodore Mark Powell at 7:37. A new casual seating arrangement is tried, because we are too lazy to move the tables. 15 Members were present at the beginning of the meeting. Commodore Mark provided an Endless Summer wrap-up, we had big fleets for A/sport/C and Kona, plus SUP. There was a brief XMAS party update, not provided by Bob Graves- event chair, who was absent from this meeting. Rather than begin business discussions in the absence of the Purser, we started with a presentation on the upcoming fall classic at Lake Lanier Sailing Club. Dave Denmark _Keys Trip coordinator followed with a brief rundown on schedule and fees and a rousing sales pitch for all and sundry to make the trip next year. The Kona Worlds coming up, Dan Burch is attending [BREAKNG NEWS FLASH –LT DAN 51st overall in the WORLD], followed by a general discussion of the ESSC, it was definitely great to see some old friends who had not made it to Shell Point in a while. Kudos again for the SUP action, we should try this again at the Stephen C Smith, thanks again to Leigh Fountain for the physical therapy for the hippies. We presented John Gilbert with the plaque for the Perry Williams Award. John said that the honor of receiving the Perry Williams Award is overwhelming because of the people in the club who make it something special. Scribes Report - Bob Graves (who was absent) did the meeting reports last month in the absence of the current scribe, an un-named miscreant who apparently can’t bother to attend meetings either. We have money in the BANK and 45 Memberships. The current bank balance is in a state of flux as event expenses for ESSC trickle in from the field. CASH$ donors for the ESSC include: Hwind Scientific, Athena Salon, Southwood Subway, Native Tikis, Lea Chapin Ketchum Realty, as well as some love from Homestead Imprinted Sportswear. Café Donaldo raked in some serious $$, thanks to the crew and the gumbo providers, they did a worthy job! The discussion then switched to training gear that we have been using. There are new boards hitting the market soon that will be well suited for teaching new windsurfers. The Hi Flys have done yeoman service year in and year out, but are getting long in the tooth and the Board will discuss replacements over the winter. Extra thanks to Tina M. for the outstanding success of the C fleet this year. Wright Finney again thanks John Gilbert for all his work, the Perry Williams Award is the service award for SPSC. Someone motioned to adjourn the meeting, someone seconded, I either didn’t notice or was too distracted to record that info. Come one come all to the Marzuq Shrine Temple on 1805 North Monroe Street!!!! This is a members and guest only event, so I you haven’t paid your dues, you can do so at the party or on-line via PayPal. Bring a side dish and a be ready to party like its 1989! Doors open at 7:30. W hen I first joined the club back in the mid nineties, I heard about the legendary parties the club would have, partying into the wee hours of the morning. Lately, I haven’t been a witness to any of that. I would like to encourage you to stay until at midnight this year. We are going to have the great Swami’s ode to Christmas around 8:30, at which time the party will kick into high gear. We want everyone to party responsibly, so please have a designated driver or imbibe moderately. For those that live far away, there are plenty of motels in the area. After the event, we need to tidy the place up, so I would appreciate a few of you staying to help get it in shape. We have been fortunate, thanks to Lee Chapin, of getting this place year after year and wish to keep it. The party is eighties themed, so if you still have clothes from that era that fit, wear them. We will have a VCR setup to show some great movies from that era and a DVD player to replay the video taken from the 1993 wind ceremony. Thou the video is from 1993, the eighties fashion and facial hair was still popular in Tallahassee! Hear yea, Hear yea, I, Robert Graves, soon to be your Imperial Commodore, challenge Mark Powell, outgoing Commodore and he of a current hip replacement, to a slalom sailboard race at Shell Point Beach the day of Festivus, December 21st. The first to lose twice goes home in shame. Does he have the courage to accept?